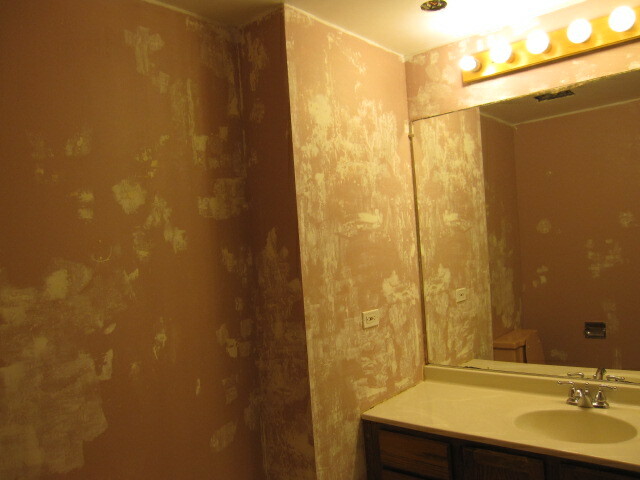 Last Spring, I decided I needed to do something about the ugly wallpaper in our main bathroom. Whoever decided to wallpaper our bathroom had no idea what they were doing. Instead of using a straight edge and a sharp razor to trim the wallpaper, it seemed like the applier had used a scissors. It was jagged and torn in some places. As I tackled the walls, some of it was easy to take off, and other parts held on for dear life. Taking down wallpaper is a horrible job, but this wallpaper NEEDED to come off! I made some discoveries as I was removing the wallpaper; there had been two other wallpapers before this one, and there was dark pink paint under this layer of wallpaper. Right in the middle of my project, the April floods hit Chicago. My basement was flooded and my sewer wouldn’t drain, so my project was on hold. 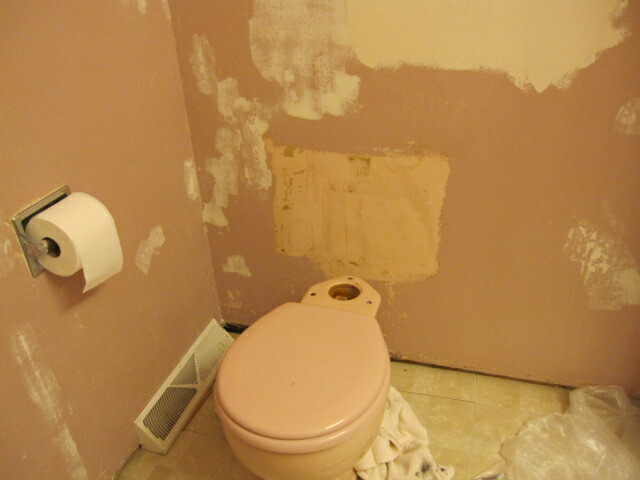 Fortunately, the bathroom was still useable, it was just gosh-darn ugly. Ugly paint, toilet and floor! At the end of May, I finally put my bathroom project back on the calendar. I patched and painted, and bought new towel racks and outlet covers. But the floor! The floor was still ugly shiny pink stick-on tiles. This was a project we wanted a professional to do. However, it was harder than I thought to find a floor guy for a bathroom. After we finally found someone to do the floor, a funny thing happened. The roof to the floor company’s building collapsed (fortunately no one was hurt) and the work was postponed. 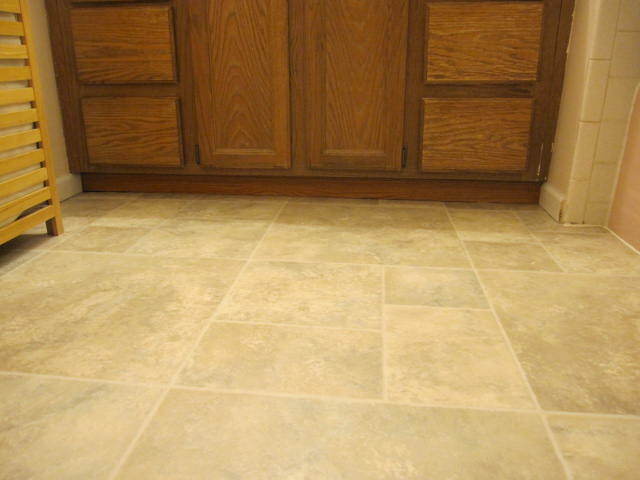 By November, we finally had a new floor in all our bathrooms. I still want a new light fixture! And ignore the mess, please. I’m not done yet; I still need to put a frame around the mirror and redo the vanity. I’d also love a new light fixture! It’s not the dream bathroom I’d love; the bathtub, toilet and vanity are still old. But for now, it’s much better than it was! What needs fixing upping at your place? Link up your blog post and visit other people’s stories! Then come back on Monday for a new Spin Cycle prompt. Wallpaper in the bathroom is the worst!! Great job on the bathroom project! 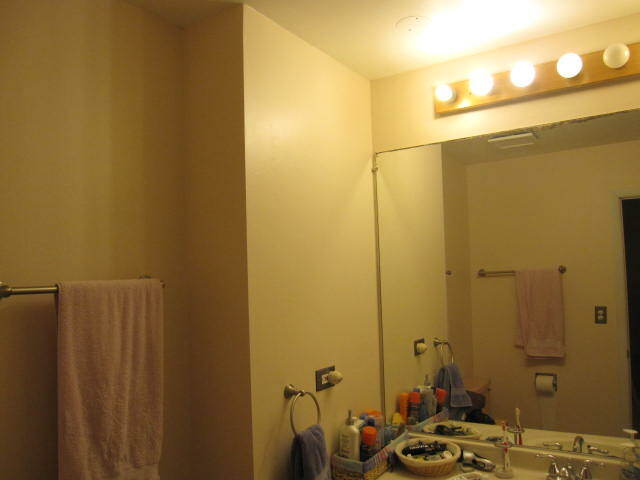 Our downstairs bathroom needs new flooring and probably a fresh coat of paint. Hopefully that project will get started if the snow ever goes away. Oh… and spare bedroom needs a makeover too. I’m waiting for warmer weather before I do any more painting projects! 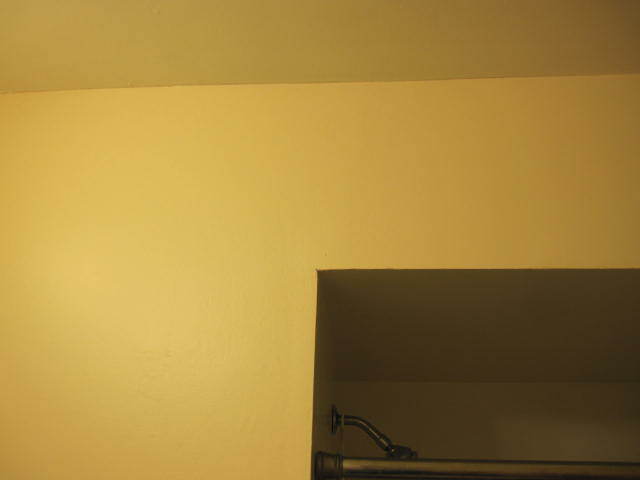 I want to repaint my master bathroom. It needs a makeover, too! Good luck with your bathroom project! Hopefully the snow will be gone from your neck of the woods soon! Oh, I love the new tile! Really pretty. I so envy you with your new and beautiful bathroom! Good job. Thank you! It’s actually linoleum, which was cheaper and still looks nice. I hope it lasts! We took our main floor bathroom back to the studs and started over. It was a scary mess when we moved in and we lived with it for 7-8 years. There was garden hose attaching the water and shower. The plumber said he’d never seen it done quite like that. The things that are done in the name of remodeling. Oh, wow, that’s somethin’! That is very scary! Way to go! That’s a lot of work and it’s looking wonderful…..
Uhg! We just did our bathroom two summers ago. Same thing, two layers of wallpaper. My husband tried to make the wall look right but you can tell where the drywall came off with the paper. Nice job! It looks fantastic! Thanks! 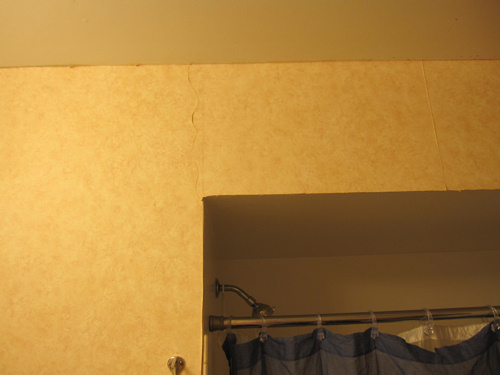 It looks really smooth in the pictures, but if you look closely you can see where the drywall had problems. The floor guy also nicked it in one spot. 🙁 But it still looks nice. Whoa, you did a nice job! I scrolled slowly and watched the video with interruptions (dog had to go out. love your shirt!) but I was a little worried for a bit there. No wallpaper here, but my parent’s house had some from the 70’s and it was a process to get it to where it is now! tamaralikecamera recently posted…The Triple Threat. I am one of the old ladies that hung wallpaper. Probably a couple thousand rolls for myself, friends and relatives. And I have taken down a couple hundred rolls of the stuff. Not easy either way. Best of luck with the next projects! Seems there is always a hiccup when remodeling. I really like a heavy vinyl neutral colored textured paper in high traffic areas such as hallways. Similar to what is used in commercial offices. Wears better than paint and easy cleanup from messy fingers. Other than that, sort of done with the wallpaper look. Yes, I do like vinyl wallpaper! My mom put some in our bedrooms when we were in high school, and it didn’t fade at all!